A line with new options has been added under the thumbnail of the current frame. Apply changes : This option is by default active for the changes to be applied gradually. When it is unchecked, changes will not be applied immediately, which can prove useful when drawings are very big. By checking the option at the end of the l'opération, you will gain some time. 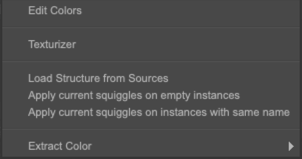 Show / hide Squiggles : This option will let you show or hide the Squiggles. Choose options : This icon will give you access to a new sub-menu. ∗ Edit colors will be explained after this section. ∗ The Texturize will be explained in the next chapter of this lesson. ∗ The Load structure from sources will let you load the structure of the current layer (the one you used to create the CTG Layer). ∗ The Apply current squiggles on empty instances options will be useful during colorization phase. It will be explained in due time. ∗ The Extract colors will be explained later in this lesson. This function opens a new panel with lots of options. It is specific to each CTG Layer. 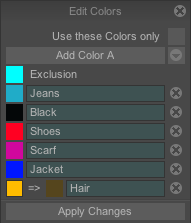 Thanks to this panel, you will be able to create a color palette, specific to your CTG Layer. 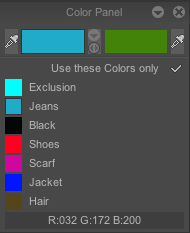 The Exclusion "color" is not a color in itself, it correspond to the empty (or alpha) backgorund of your workspace. By clicking on it, you will notice that the Exclusion checkbox (on the Tool : Speedfil panel) is automacically checked. Its default color is a pure turquoise (0-255-255), but you just have to click on its square to change its color with the picker. - Create a color in the Color Panel with the various options available (Sliders, Chromatic wheel…). - Click on Add Color A, the color appears under Exclusion. - Create a new color and reiterate the process as many times as necessary. - You can name each color thanks to the adjacent alphanumeric field. Naming is highly advised : it will be useful for team work, but also for other functions, like Extract Colors or Texturization. 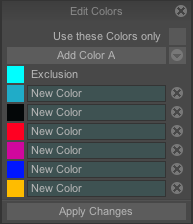 Should you wish to remove one of these colors, click on the corresponding cross on the right, then on Apply changes. If you missclicked on the cross, before clicking on Apply changes, you can cancel this action by clicking on the new cross with the => symbol appearing next to the color square. And if you did apply, you can go back with Undo. To replace a color by another one, you just need to click on its square. The picker (the arrow with a question mark on top) will let you choose another color in the Color Panel or in the interface. A new square appears next to the first one with the => symbol between them. Click on Apply changes, the color is then replaced. If you change your mind before Applying changes, you can always click on one or the other colors, and choose the inital color with the picker for the second square to disappear. If you did apply, you can of course go back with the Undo function. You then can Save your list or Load from a file. 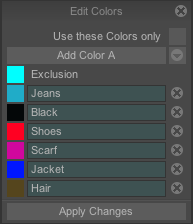 This will let you share this color list with other people or to reuse a list for other projects. You can also Remove all colors. By clicking on the square next to Use these colors only, the panel will anchor to the left Drawer under the Color Panel, under the A & B Colors. The status bar (at the bottom) will show the colors in RGB, and as for the Color Panel’s other options, you can see other status (HSL or hexadecimal) by clicking on it. The Add Color A and Apply changes buttons will disappear, preventing you form adding or removing colors. Your panel is protected : there is no risk to lose or swap a color by mistake. 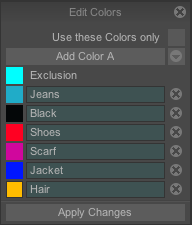 This function is very handy when working with a team..
By unchecking the Use these colors only, the panel will be back to its original location on the interface, and its core options will be available once again. The Color Panel will also be accessible again.